Nowhere in Palm Springs is it as mid-century modern as inside Trina Turk, a store at the North end that has become a designer's showcase. The store opened in 2002, and now, if you haven't already noticed, she's got a new store--Mr. Turk. Men and women alike can now choose from a selection of garments that revisit 1960s and 70s colors and patterns. So, just who is Trina Turk? The name has become synonymous with the Palm Springs lifestyle, refreshing swimming pools, indoor-outdoor living spaces and retro wardrobes. Her clothing line is a reconstituted mix of mid-century fabrics and patterns, a contemporary-pop mix that's popular with Hollywood celebrities like Lisa Kudrow. Sunset, a popular Western United States magazine calls Trina Turk, "The Queen of Prints." The LA Times profiled her in June 2012, when Banana Republic picked up her lively brand. Combine that with the fact that she runs seven boutiques in the trendiest of United States cities, and you've got one busy, influential woman. Photography is best in Palm Springs right after a storm. As winter in the Coachella Valley winds down, the late storms are often the best for a sharp-shooter. 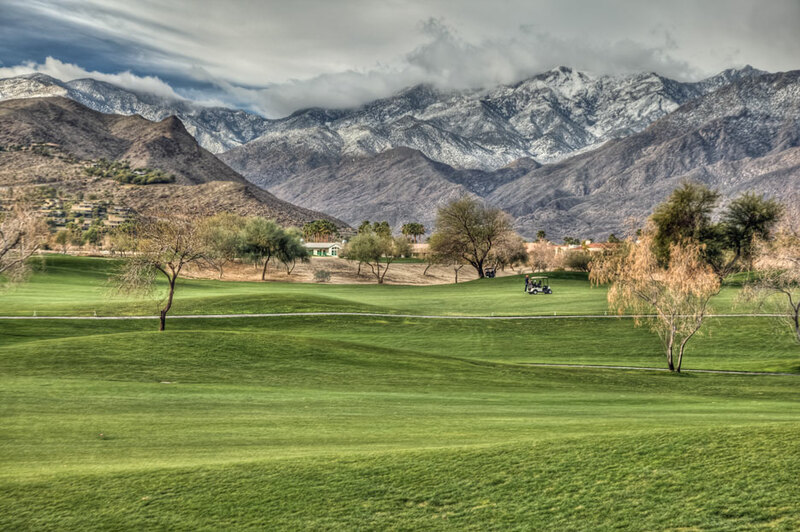 The perfect place and time for you to shoot is the golf course right after a storm in Palm Springs. The cold air drops the elevation of the snow level. Some winters the snow level is near the ground, providing for the best photo ops. The HDR (High Dynamic Range) image above, taken two days ago (mid-February, 2013) shows a snow level of about 2,500-3,000 feet. At this time of year the grass is its most verdant--a lovely dark green carpet that leads up to the mountain. Some years the mountains turn green by February. This isn't the case in 2013 because of the length of time between each storm and the sparse rainfall each produced (no more than .2 inches). This rainy season produced nothing near the record rainfall three years ago this month. The February totals back then were about 4.5 inches after days and days of relentless downpours. You just have to remember one weather fact, winter isn't over yet. There is a possibility of getting abundant rainfall for about one more month. Lest anyone forget that Palm Springs is a town of the Wild West. From cowboys to the tribes in the area the characters that made up early Palm Springs wild western culture inspired incoming residents to place a high value on the landscape and spirit of the mountains and valley. Former mayor Frank Bogert, the best known cowboy of Palm Springs, wanted the city to be the Western movies capital of the world, which, if you include the high desert area nearby, it certainly became. As a place of cacti, guns and saloons, it was also a place of the spirit, thanks to the Native Americans, who valued land, water and sky, giving it respect and honor. The cowboys have followed the tribe's respect-the-environment attitude until this day. 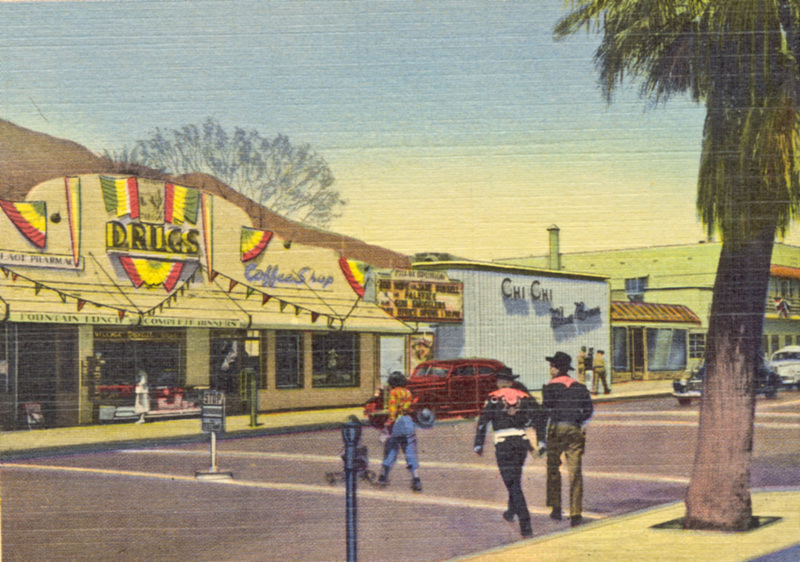 The cowboy hangout was and probably always will be Smoke Tree Ranch in the southern part of the city. Another, not far away is B-Bar-Ranch in Desert Hot Springs. A trip out there is well worth it. Within the housing development are the original Spanish buildings, a secretive retreat of the cowboy stars. If you're here for Modernism Week, which started today, don't miss out on some of the greatest mid-century modern on the planet. The bus tours take you from one 1950s modern architecture house to another; however, you can go on your own by driving around, having the opportunity to stop wherever and whenever you want. 1. Palm Springs City Hall--right near the airport on Tahquitz Canyon Way, traveling away from the mountain. You'll see the airport at the end of the road. Look on the left. 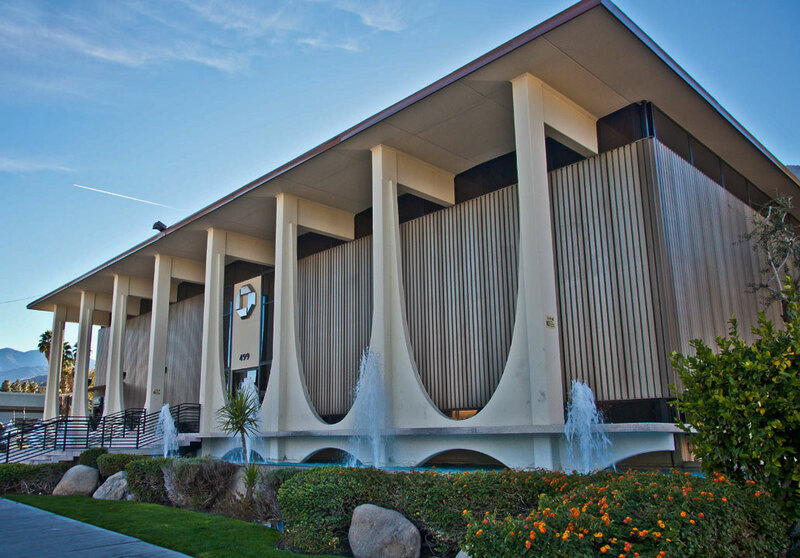 Right before you get to the airport is Palm Springs City Hall, classic 1950s modern architecture. 2. Town and Country Plaza--This classic piece of architectural beauty is a bit hard to find because the back of the building is on Palm Canyon, and the entrance to the building is down a hallway near 166 N. Palm Canyon. Go down the hallway and you'll run into a patch of grass. Walk toward it and you'll see the round building, which used to be the entrance. 3. Caliente Tropics--Add a bit of the Polynesian God, Tiki, to your trip, by stopping by the Caliente Tropics Hotel, located south of downtown on Palm Canyon. If you're driving from downtown it's on the right about a mile south of Ramon. You can't miss the beautiful brown and orange A-frame carport. Simply marvelous. 4. Kaufman House--This house, a classic mid-century modern abode, is in the North end of the city near the Design District (where all the mid-century modern stores are). Coming from downtown from the south, keep driving till you get to Vista Chino. Then make a left. The Kaufman House is up the small hill a bit on the right. 5. Googie Architecture--Just north of Vista Chino on the right side of the street is a liquor store with a dramatic roof that sweeps toward the sky. It's a must-see--a sample of Googie. 6. Chase Bank-- End your tour back downtown at the Chase Bank building (formally Washington Mutual). It's south of Town and Country Plaza near Ramon. 7. Bank of America Building--Across the street and a block south is the Bank of America Building, another classic. There's much more, including great modernist homes and condos on South Palm Canyon and in the back streets that lie against the mountain adjacent to downtown. 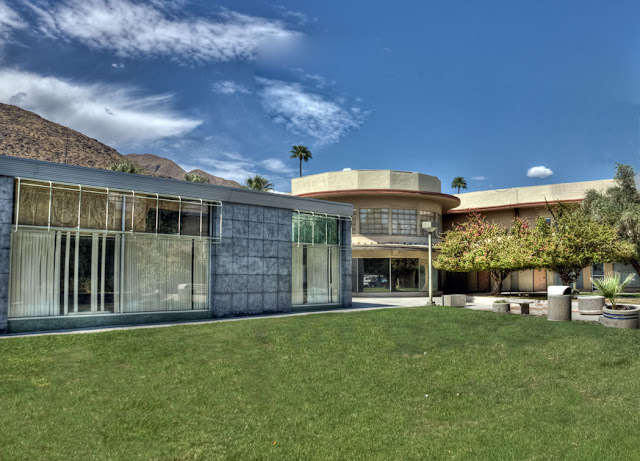 The Town and Country Center in Palm Springs--quintessential, mid-century modern architecture-- was designed by architects Paul R. Williams and A. Quincy Jones, the former being one of the only African American designers working in Palm Springs. Constructed in 1948, the building, shown in the background of the above image, housed both retail space and residences. It had a beautiful garden in front right where you see the grassy area in the image above. The building looks as if it's in pretty good condition, but that doesn't mean it isn't susceptible to the wrecking ball. I hope the image above convinces you that, yes, indeed, this building is a classic with it's floor-to-ceiling glass and unique layout, not to mention the round shape of the building entrance. A survey done on the Town and Country Plaza nearly a decade ago found that the building wasn't in terrible shape and referred to it as “a rare and excellent example of the late Moderne style." Preservationists are concerned that one day the building will be demolished to make room for a bigger development that will bring more cash to the city. What were they thinking when they built tie Desert Fashion Plaza? The Desert Fashion Plaza, once home to glamorous department stores, restaurants (including Hamburger Hamlet) and an air-conditioned walkway, is no more. The wrecking ball came down on the now-eyesore last week. 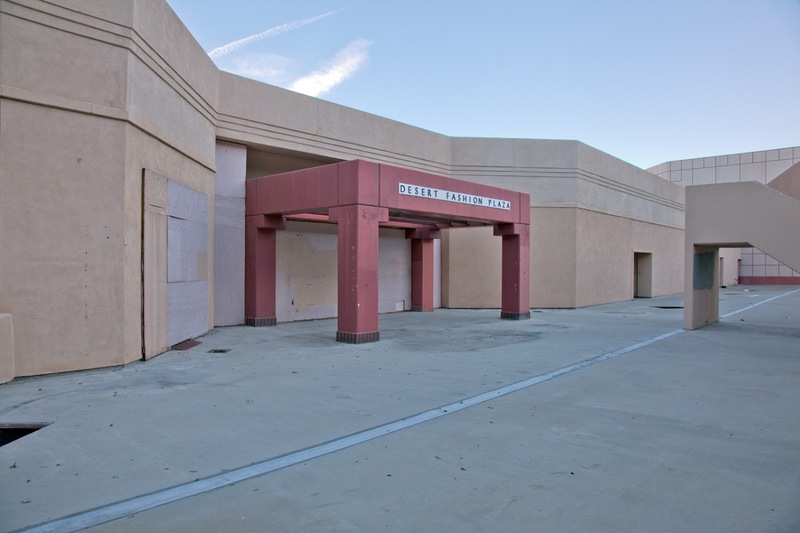 The Desert Fashion Plaza is now history. Just a week ago I walked through the parking garage to find the South entrance of the oddly-planned edifice. The massive concrete blog, a faux Southwest design nightmare, has been an eyesore right at the heart of downtown Palm Springs for more than a decade. The property , owned by John Wessman of Wessman Development, is to undergo a rebuilding project that costs close to $100 million dollars. The new development is supposed to house a multi-screen cinema complex, condos and close to a dozen storefronts. The completion date is expected to be sometime in 2015. Come Valentines Day, mid-century (that's the 20th) is the talk of the town in Palm Springs as storekeepers and modern aficionados begin a week of showing off anything and everything that's made or looks to be made in the period between 1920s and the 1980s. From Art Deco to 1980s chrome-and-glass, the Palm Springs Modernism Week doesn't miss a beat. This over-the-top, enthusiastic conversation has become a hipster international-speak, where people from all over the world to experience the Disneyesque mid-century modern celebration in Palm Springs, the center of the world for this sort of thing. About a decade ago it was just a gathering of venders from all over the United States coming to sell their mid-twentieth century modern wares. Today, it's a week-long event with activities (dozens of them), tours, modernism sale and lectures. As for the digital art above, it's a piece constructed from a television set in the store The Modern Way. 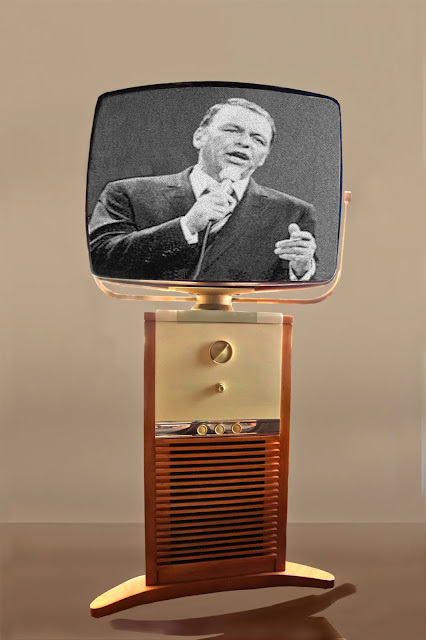 (The modern TV set is quintessential for the purist mid-century modern collector.) It's one of the most incredible ones I've ever seen in a store that's filled with authentic mid-century modern wares from furnishings to accessories. There is a large Jewish community in the Coachella Valley, many of whom are Hasidic. The number of Jews in the Coachella Valley, 32,000, makes it one of the largest Jewish communities in the United States. In Palm Desert anywhere from an eighth to a quarter of the population is Jewish. The breadth of the Jewish community in and around Palm Springs extends from the mostly secular to the strictest of the orthodox, the later of which is the least understood. 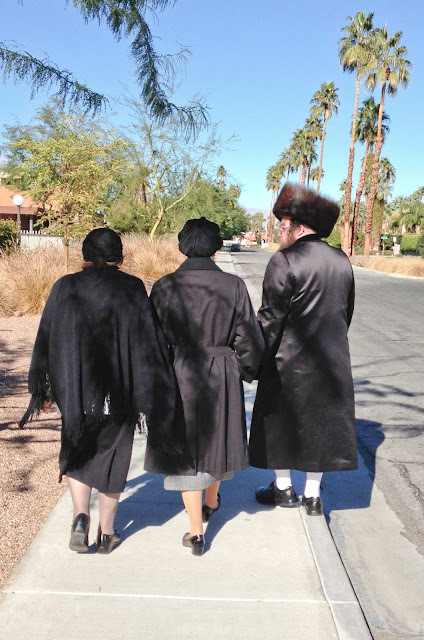 Among the Jewish people of the Palm Springs area, are the Hasidic Jews , a people who are deeply religious and conservative in dress and culture. Covering the entire body is the norm for both Hasidic men and women, no matter how hot it is. Men wear heavy hats of rabbit fur and long black coats, women, long sleeves and skirts dangling around their ankles. Last summer in an article about Hasidic Jews, the New York Times writer, Joseph Berger, proposed that many New Yorkers probably ponder the question of "How in the world do they they stay cool?" Berger reported that they are used to it. "The Hasidim will tell you they have learned to live comfortably in all seasons with their daily attire," he wrote. The image above, taken on the Sabbath, reveals the man wearing a shtreimel (שטרײַמל), the tall hat that is part of the holy day's observance, which is marked by rest and relaxation.